Abstract. Sesquiterpenes are an important class of biogenic volatile organic compounds (BVOCs) and have a high secondary organic aerosol (SOA) forming potential. However, SOA formation from sesquiterpene oxidation has received less attention compared to other BVOCs such as monoterpenes, and the underlying mechanisms remain poorly understood. In this work, we present a comprehensive experimental investigation of the ozonolysis of α-cedrene both in a glass flow reactor (27–44 s reaction times) and in static Teflon chambers (30–60 min reaction times). The SOA was collected by impaction or filters, followed by analysis using attenuated total reflectance Fourier transform infrared (ATR-FTIR) spectroscopy and electrospray ionization mass spectrometry (ESI-MS), or measured online using direct analysis in real-time mass spectrometry (DART-MS) and aerosol mass spectrometry (AMS). The slow evaporation of 2-ethylhexyl nitrate that was incorporated into the SOA during its formation and growth gives an estimated diffusion coefficient of 3 × 10−15 cm2 s−1 and shows that SOA is a highly viscous semisolid. 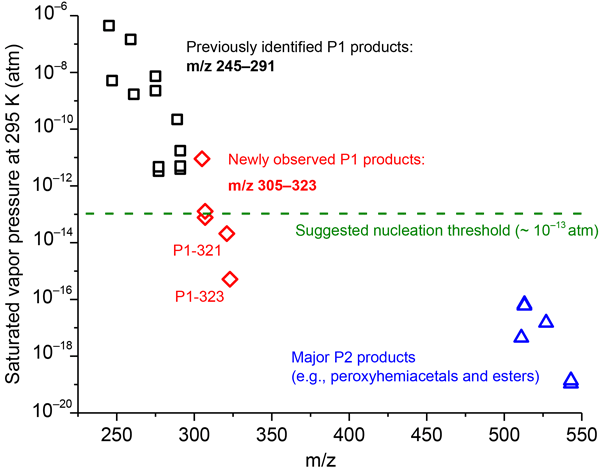 Possible structures of four newly observed low molecular weight (MW ≤ 300 Da) reaction products with higher oxygen content than those previously reported were identified. High molecular weight (HMW) products formed in the early stages of the oxidation have structures consistent with aldol condensation products, peroxyhemiacetals, and esters. The size-dependent distributions of HMW products in the SOA, as well as the effects of stabilized Criegee intermediate (SCI) scavengers on HMW products and particle formation, confirm that HMW products and reactions of SCI play a crucial role in early stages of particle formation. Our studies provide new insights into mechanisms of SOA formation and growth in α-cedrene ozonolysis and the important role of sesquiterpenes in new particle formation as suggested by field measurements. 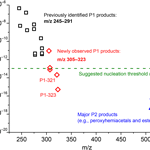 How to cite: Zhao, Y., Wingen, L. M., Perraud, V., and Finlayson-Pitts, B. J.: Phase, composition, and growth mechanism for secondary organic aerosol from the ozonolysis of α-cedrene, Atmos. Chem. Phys., 16, 3245-3264, https://doi.org/10.5194/acp-16-3245-2016, 2016.